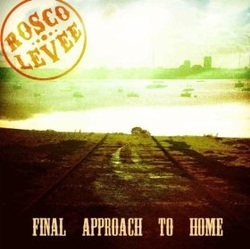 Rosco Levee is a Kent native who seems to have mastered several strands of classic American Roots music, ranging from country rock to roots rock, even instilling a little bluesiness at times. His excellent expressive vocals seem capable of covering a wide range of emotions and tempos as does his just as good songwriting. Although he has previously released an e.p this is his full album debut and puts him up among the best in the land in his chosen genre. He has put together a high quality band consisting of Rosco himself on lead vocals, lead and slide guitars, percussion and songwriting with Andy Hayes on rhythm guitar and mandolin, Lee Wilson, piano and Hammond, Simon gardiner plays bass guitar, percussion and backing vocals and David Tettmar on drums and backing vocals. All are fairly obviously well versed in this music and have an instinctive feel for it and the album is co-produced by Rosco and the band. Rosco names Robert Johnson, Delaney Bramblett, The Allman Brothers and The Band amongst his influences and it is no great act of genius to discern these influences from the opening slashing bluesy slide guitar of Goldrush to the closing bars of the excellent final track of rootsy country rock When you’re gone to ramble, although there is nothing overt linking Rosco’s music to these influences and there is a quite a strongindividuality to the recording. Between these aforementioned two songs there are several roots rockers such as All may change tonight an excellent song that includes elements of blues and country in a story about life on the wrong side of the tracks. From this we jump to Never stops, a gorgeous jangly quite mellow sounding country rocker with tremendous harmonies that have rarely, if ever, been bettered in this genre. Similarly Whatever you need is another excellent mid tempo country rocker that lopes along nicely and there is also a really good ‘murder ballad’ with a nice chiming banjo in the mix on Ol’ Shanky Shake. Some quite evocative mariachi horns add atmosphere to the moody haunting country rock of Hey Lady, a song that also has the feel of what has come to be known as ‘desert rock’ with its twangy evocation of the wide open desert spaces of Arizona and New Mexico. Originality in music is something that most struggle to come up with and this excellent band are no different in that regard. Having said that, the artists influences have been absorbed and blended well with some good ideas of his own and in the resultant stew there is a strong individuality to the album that promises much for the future. Rosco and his band can certainly be looked upon as one of the best in this country within the confines of the American roots genre and from what I gather people in the U.S are also starting to take note. All in all a promising debut from someone who promises even more in the future.